The first Yellowstone was built in 1928 by ALCO for the Northern Pacific for running throughout the high speed plains of North Dakota. It would turn out to be the one and only Yellowstone that ALCO would build. NP wanted to burn low-grade Rosebud coal (obtained from mines along the line) in their locomotives. This required the Yellowstone to be designed with a huge (the largest ever used on a steam locomotive) firebox (182 sq. ft.). The front half of the firebox was over the two rear pairs of drivers and the trailing truck (which was equipped with a booster). It was the largest steam locomotive in the world (at that time) and ALCO celebrated by serving dinner to 12 people seated in the firebox! Remember, this was long before the Big Boys were even a thought. NP asked for bids for 11 more like it and in 1930 Baldwin got the job. The NP Yellowstones steamed poorly and produced less that 5,000 HP. NP found that the grates were simply too large to maintain a high temperature and complete combustion. The combustion problem was solved by blocking off The front two feet of the firebox on each locomotive. At some point the Z-5s were upgraded with roller bearings. Data from tables in 1930 Locomotive Cyclopedia, confirmed by locomotive diagrams from 1949 hosted on  (7 Feb 2004). See also DeGolyer, Volume 82, pp. 307+; and "Largest Locomotive Ever Built - Northern Pacific Railway", Railway Journal, Volume 35, No 2 (February 1929), pp. 22 . (Thanks to Bill Hoehn, whose 11 February 2013 inquiry about the 1941 update led to Locobase's revision of this entry and to Chris Hohl, whose 7 March 2015 email provided a correction on the tender's coal capacity.) Baldwin works numbers were 61292-61293 in April 1930; 61356-61358, 61380-61381 in May; 61419-61420, 61434 in July; and 61495 in September. These were known as "Yellowstones" and gave the name to the wheel arrangement. The first engine (5000) was built by Alco-Schenectady and had works number 67578. Its adhesion weight came to 553,000 lb (2251,230 kg) and total engine weight amounted to 717,000 lb (325,226 kg). Maximum axle loading was 70,500 lb (31,978 kg). For some reason, this mostly Alco road then gave the production order to Baldwin. The Q&C "Nogroth" grate seems to have been a rosebud rocker design, intended "to burn sub-bituminous coal.". The 3/8" (9.5 mm) diameter hole provided air and the perforated plates rocked "both ways" with a 4 1/2" (114.5 mm) opening. Three Nicholson thermic syphons in the firebox and two in the combustion chamber contributed 256 sq ft (23.8 sq m) to direct heating surface area. The combustion chamber itself added another 162 sq ft (15.05 sq m). 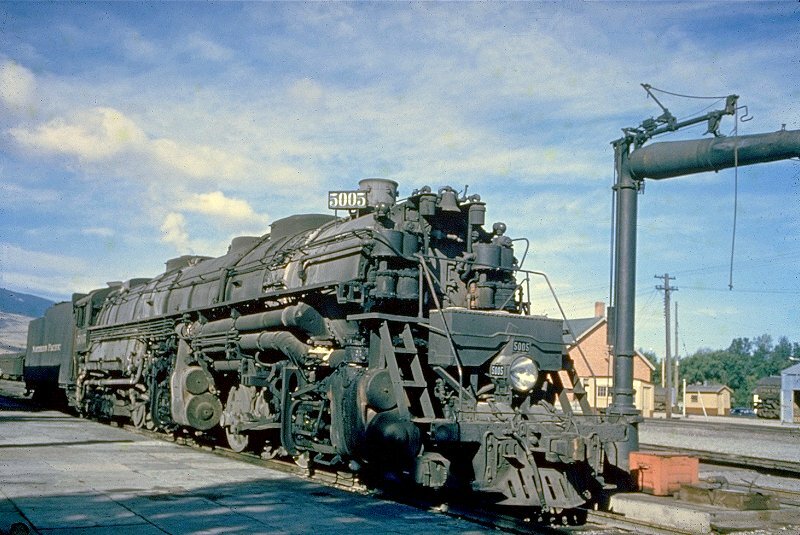 The design also featured Type B Dupont Simplex stokers with a capacity of 20 short tons (18,144 kg) of coal per hour, Alco Type G power reverse gear, and a Coffin feedwater heater. Tonnage rating over a ruling grade of 1.1% was 4,000 tons (3,636 metric tons). This class was rebuilt with Timken roller bearings in 1944, given a sturdier front frame, had steam leaks sealed, and run at a higher boiler pressure, producing 145,930 lb (66,193 kg) of tractive effort. The feed water heaters were removed in the late 1940s.